Thank you to all of you who played along with my sketch challenge this week. I know we say this every week, but it really is true. All the wonderful entries made it very difficult for our design team to choose their winners. We love to see how differently you interpret our challenges. 2. Claire's Choice: Shawna's gorgeous Valentine captured my heart! Love the clock, embossing & hearts! 3. Ann's Choice: Jan's card was stunning with its beautifully colored butterflies and gold embossing! 4. Laurie's choice:I love Pam's CAS Valentine...just beautiful! Congrats! 5. Joanne's Choice: Stef's loved-up penguin is adorable and coloured to perfection. Bravo! 6. LeAnne's Choice: Lisa's sweet Christmas characters are as cute as can be! Congrats! 7. 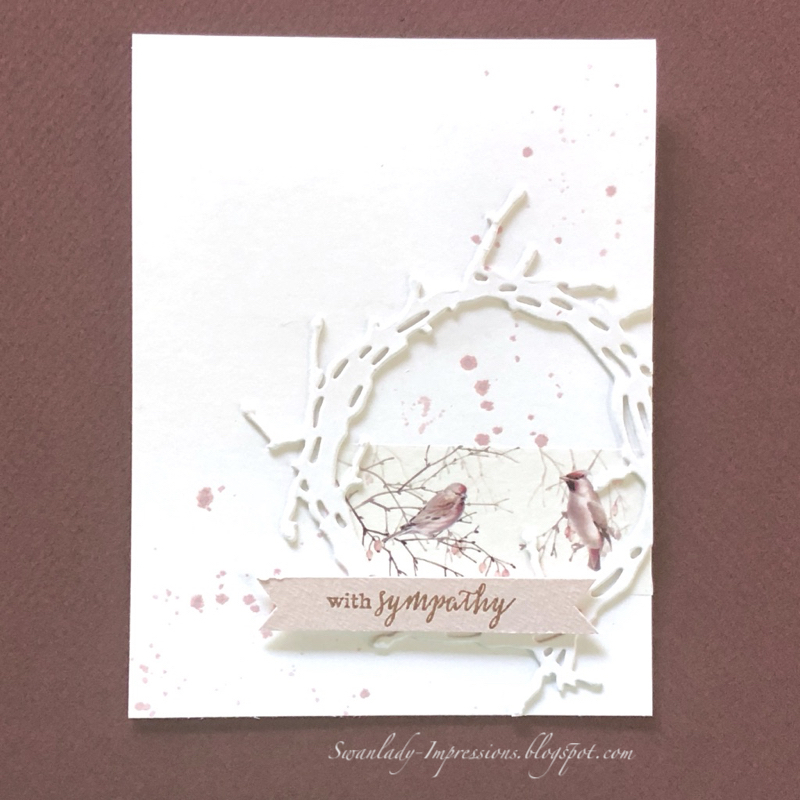 Anne Marie's Choice: I just loved Vicki's beautiful card! Gorgeous coloring and fab details! Wow! 8. Wanda's Choice: Hannelie's details make this a stand out CAS beauty! Janet's subtle colors are just perfect for a sympathy card. Although the card is clean and simple, there is so much interest in the texture of the die-cut, the popped up sentiment, the splatters and the wonderful use of Washi tape. This is a gorgeous card. Congratulations, Janet. You are my HEADLINER this week. We hope you will join us again tomorrow for Joanne's fabulous THEME challenge. Winner is well deserved... congrats Janet!!! Also, thank you Claire for the shout out! Confidence is coming back from being away so long. Thank you for the kind words. Thanks for picking my card ... it was a lovely sketch. Congrats to all the A Cut Aboves too. Joanne, thank you so much for choosing my card as your Cut Above this week, it's so appreciated!! Also congrats to our Headliner Janet and all the other DT picks! Thank you so much LeAnne, I'm thrilled you liked my card! Congrats to all the picks, and especially Janet on her lovely card! Thank you so much Laurie! Congrats everyone!